Get perfectly in tune quickly and easily with this updated take on a classic. 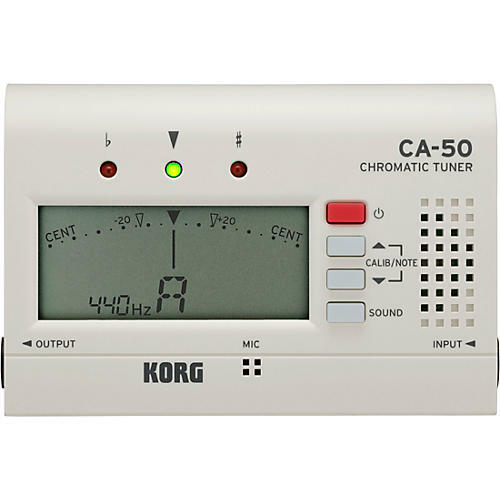 Long considered the standard in chromatic tuners, the Korg CA-50 offers simple and intuitive operation and a satisfying tuning experience for every instrumentalist. The LCD screen of the CA-50 has been enlarged to improve visibility, making it even easier to quickly and accurately check your tuning. The wide detection range of the CA-50 allows you to tune band or orchestral instruments of any pitch range using the high sensitivity built-in microphone, or by using the separately sold CM-200 contact microphone. The CA-50 also features a drastically improved battery life, allowing for 135 hours of use. Additional functions like memory backup and auto power-off make the CA-50 the most reliable and fully-featured compact tuner on the market.